We are very pleased to announce that there has been a shift in your Earth’s energy field and that you are tapping in to higher frequencies because of it. The Earth is of course shifting with you. She is leading the shift, in fact, and you are all riding on her back as she does. You need to think of your Earth as a collective being, rather than as a planet, and you need to see her as representing the collective consciousness of humanity and the animal, plant and mineral kingdoms. So when she experiences a shift in her electromagnetic field, it is because she is reflecting back to you the progress that you’ve been making. When you all reach out and up to higher dimensions and other star systems, and you bring that energy in and ground it into yourselves, you shift your collective consciousness. And of course, you make that energy available to planet Earth and all of her inhabitants. Therefore, it is because you have awakened your interest in other beings that this shift in the Earth’s electromagnetic field has occurred. All of these events were planned, to a certain extent, before you incarnated in this lifetime. However, there was always the choice in front of you of fear. You could have feared progress. You could have feared reaching out and up to beings and collectives like ourselves. You could have played it safe and just adopted your parents’ and grandparents’ beliefs. You could have stayed with the old religions that seemed time-tested. But you chose to go with what felt right to you instead, and now here you are. You are anchoring in these energies. You are making a difference, and everyone in the galaxy is taking notice. We are not the only ones. So the more you connect now with Mother Earth, the easier it will be for you to feel the progression that is taking place, and the more you go within to feel your extra-terrestrial DNA coming online, the more you will get that confirmation. 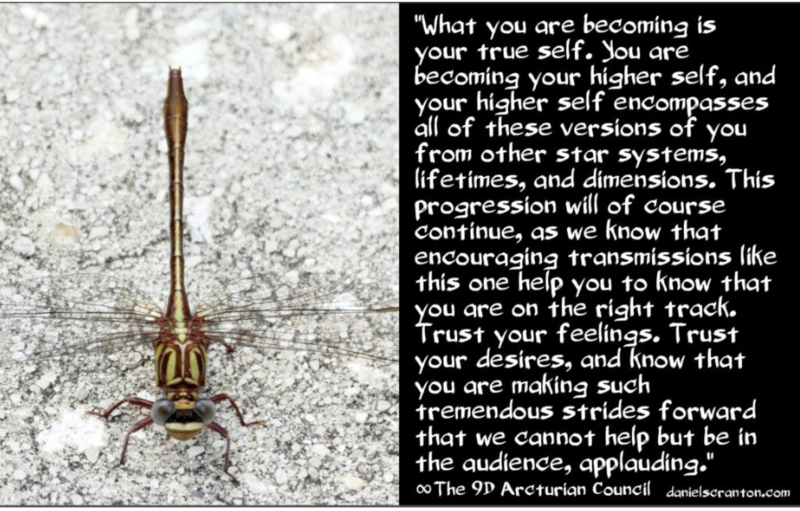 What you are becoming is your true self. You are becoming your higher self, and your higher self encompasses all of these versions of you from other star systems, lifetimes, and dimensions. This progression will of course continue, as we know that encouraging transmissions like this one help you to know that you are on the right track. Trust your feelings. Trust your desires, and know that you are making such tremendous strides forward that we cannot help but be in the audience, applauding and congratulating you for how far you’ve come.